Here are the goodies you can find from REIGN at project limited. along with some vital information. Project limited is an event where everything sold is only sold in limited edition’s…. Ex. 250 Copies, these items will never… NEVER be sold again, once they are gone they are gone forever. NO EXCEPTIONS. The event opens at 12pm SLT on 7/10/14- Please do not try to shop from neighboring sim’s as this will result in a ban for 24 hours causing you to miss out on the goodies. A full body alpha is included in the project limited pack sent out in the reign group so that you can come wearing this… and only this. We would hate to see you guys get ejected for script count after trying so hard to get in.. chances are, you will not get in a second time. (PLEASE COME IN JUST THE ALPHA DONT BE BRAVE.. IT WONT WORK). 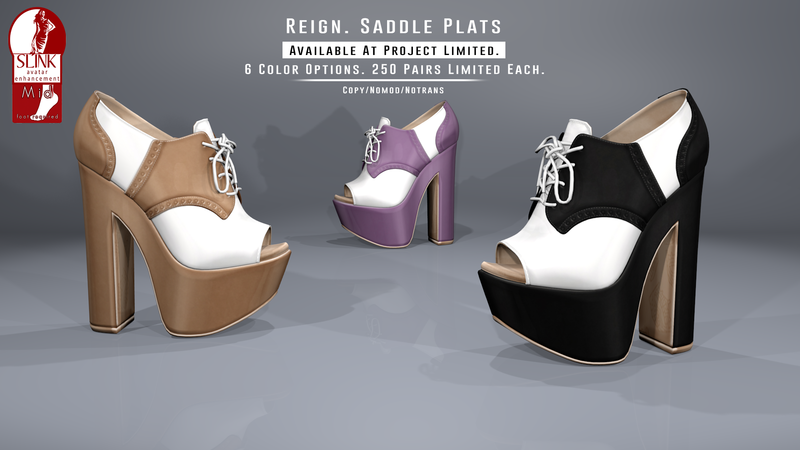 THE SADDLE PLATS (SLINK MID FEET)- 6 Colors 375L Each, Only 250 Sold. They do come in a fatpack option for 2000L Only 100 fatpacks will be sold. 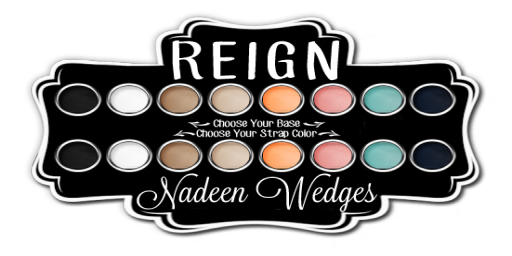 THE NADEEN WEDGES (SLINK MID FEET)- These are a bit different, there are only 6 individual colors being sold however the fatpack includes 2 exclusive colors you can not buy seperately. They will be 375L each and all come with a hud to change the smaller strap colors, only 250 of these will be sold and fatpacks are 2000L, only 100 of those will be sold. THESE SHOES WILL SELL OUT FAST, THERE ARE 5K OF YOU IN THE GROUP, PLEASE DO NOT MISS OUT AND ASK FOR US TO SECRETLY SELL THEM TO YOU LATER, WE LOVE YOU BUT IT WILL NOT HAPPEN. If you have any questions not answered here please feel free to contact kenadeecole resident.